Despite its tendency to sit quietly as “America’s Dairyland,” is a state that is incredibly special. The land flows effortlessly from fields of golden wheat to breathtaking rock formations, from rolling green hills to waterfalls; and while its neighbor claims the nickname of “Land of the Lakes,” Wisconsin actually hosts a few thousand more. For brides and grooms who dream of a quiet vow ceremony against a backdrop of waves and gulls, there are two Great Lakes in particular that can claim to be as large as some seas. We wanted to showcase the pristine beauty of Lake Michigan with this styled beach elopement, so we chose a location just ten minutes outside of Milwaukee that is rich in views and boasts over 800 feet of sandy shoreline. using what a bride and groom would likely bring to the shores themselves for a very intimate setting. 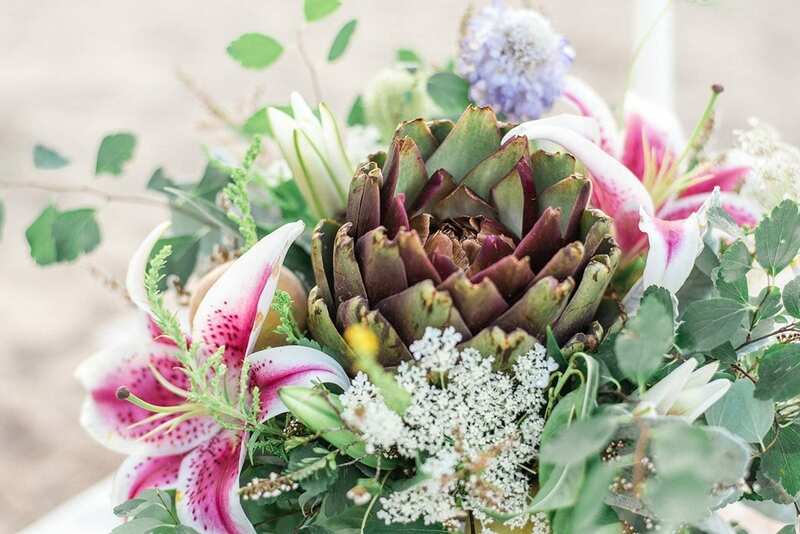 The colorful and beautifully untamed florals provided by Vy’s Floral Design out of Chicago added the perfect accent for a free-spirited beach elopement. Our bride wore a flowing, ombré MinkMaids gown, paired with makeup that highlighted her features with a soft touch. Quartz bridal accessories completed the raw, simple elegance of her look, and our groom kept his own look natural and effortless. To highlight the tones of the water and surrounding vistas, our colors were organized around soft blues, blue-tinted greens, and white, with a touch of the delicate blush of a beach sunset. Genuine crystal quartz attached to a tiara base with wire. Double layer genuine crystal quartz choker pendant adorned with a Swarovski crystal. Genuine crystal quartz earrings with Swarovski crystals.